It is the habit of the Union County Republican Committee to not endorse candidates, instead respecting the right of Republican voters to choose their own nominees. However, UCRC accepts the inherent responsibility to vet candidates and interact with their campaigns for the good of the Republican Party. To that end, all commissioner candidates were asked to complete this candidate survey and attend a UCRC meeting to avail themselves of the opportunity to meet the committee, answer questions, and seek support from individual committee members. (1) Why are you a Republican? (2) What are the pressing needs and priorities for the office you’re seeking? (3) What do you bring to the position? Preston Boop answered the questions at a UCRC meeting but did not submit them in written form. Lewisburg High School senior Paul Crouch gave his graduation project presentation today. Paul has been working closely with UCRC since September. He has researched how the party functions from the RNC to state to county and local levels, as well as participating in campaign activities. Paul spent a day shadowing Rep. Fred Keller in Harrisburg. Congratulations, Paul! Show your support for UCRC and Rep. Fred Keller in the May 21st Special Election. This event will help us help Fred as he seeks the 12th CD seat in congress. Click below for more details. RSVP by April 20. Advertising opportunities are available for the printed program. 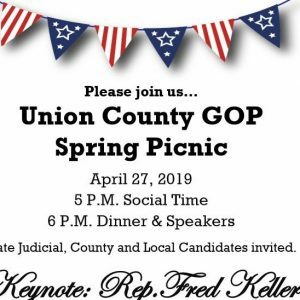 Contact chairman@unioncountygop.com for details. Conferees from the 15 counties in CD12 chose Rep. Fred Keller to be the Republican nominee for the May 21 special election to replace resigned Congressman Tom Marino. Fred Keller has been an outstanding representative for Union and Snyder counties since 2011 and we are sure he will continue that legacy in Washington DC.